Dairy Queen is giving away a free cone to celebrate the first day of spring. In honor of their 35th year of partnership with Children’s Miracle Network Hospitals, DQ® locations across the nation will celebrate Children’s Hospitals Week and the first day of spring with their annual Free Cone Day on March 20. Please reach out to your local DQ using the link above to see if they are participating! Everyone can celebrate the first day of spring with a free sweet treat at participating non-mall Dairy Queen® and DQ Grill & Chill® locations and help bring happiness and healing to kids at their local children’s hospital. Customers will receive a free small soft serve cone just for coming in on March 20. Some locations will use the opportunity to raise critical funds for their local children’s hospital, with the goal of bringing comfort and smiles to kids treated at 170 children’s hospitals across the U.S. and Canada. Over the last 35 years, the Dairy Queen system has raised more than $145 million for local children’s hospitals in an effort to bring hope and happiness to kids when they need it the most. In addition to the free cone, Some DQ stores offer a $1 donation for delicious dipped cone upgrades on #FreeConeDay benefiting our wonderful partnership with Children’s Miracle Network Hospitals. Donations and participation are determined by each of our independent franchisee owners and will vary by location, along with menu items offered. 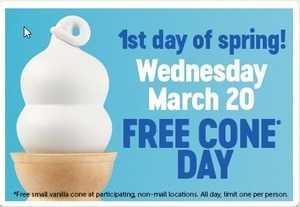 Celebrate the first day of spring with Dairy Queen! They’re offering a free soft serve ice cream cone to fans and raising money for Children’s Miracle Network. Visit your favorite participating Dairy Queen location for your free cone and to make a donation to Sanford Children’s Miracle Network! Click here to find a Dairy Queen near you!